Several years ago, CCQ published a document to help others start similar programs teaching quilting in prisons. We’re thrilled to hear that Snake River Correctional Institution has done just that. SRCI is a men’s prison in Malheur County, Oregon. 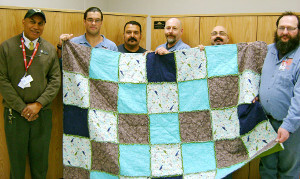 Five men participate in the SRCI program, meeting four hours each week for 18 months to make donation quilts. So far, the quilting program has given away 17 quilts to community agencies including Harvest House, Treasure Valley Children’s Relief Nursery and the in-house hospice unit at SRCI. The Malheur County Argus Observer newspaper recently published a touching feature story about the SRCI quilting program. We’re providing a link to “Prison inmates crafting care” so you can learn more about it. If you’re interested in starting a prison quilting program in your area, we invite you to read The Coffee Creek Quilters Program: A Guide for Starting Quilting Classes in Correctional Facilities.